I went to Ware last week to see the church. Unfortunately, although the church is open every day and very welcoming, I couldn't see much at all because of the weather. The rain was so torrential and the sky so dark that light levels in the church were somewhere between a bit gloomy and definitely murky. I persisted for a while, but gave up and went for lunch, hoping things would improve. They didn't, so I went home. Today looked better, so I tried again. One of the first things you see when you enter, as it's more or less opposite the door, is this monument to the Rev. Robert Atkinson, his wife and daughter. At first glance it looks an attractive enough ('pretty' is Pevsner's adjective) fairly typical mid-Georgian piece, with an oval cartouche set against an obelisk. But if you take the time to read the inscription, what a melancholy tale it tells. All monuments record deaths, so naturally they're all mournful, but this is something out of the ordinary. 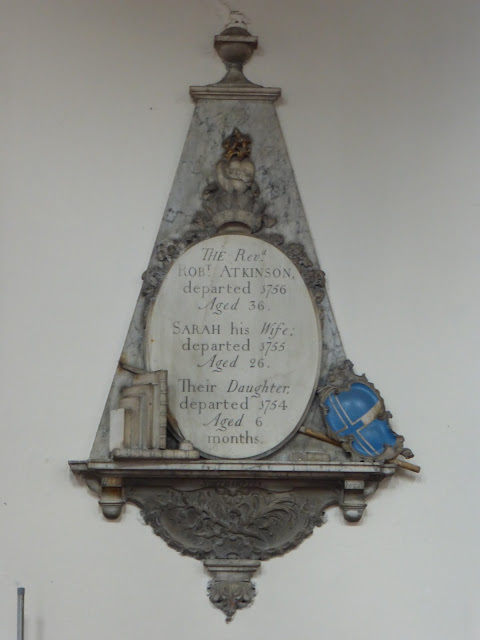 In 1754, the unnamed six month old daughter of Robert and Sarah Atkinson died (or 'departed'). What grief they must have felt. Then, next year, Sarah died, aged only 26. Perhaps she never recovered from her daughter's death; we'll never know. How Robert too must have suffered and mourned. Then, one short year later, after losing both his young daughter and his wife, Robert died. The sight of the two overlapping hearts* is almost unbearable. This monument also stands out because of the books, pot of ink and quill pen on the bottom left. They are presumably there to indicate that Robert was an educated man (he was a Reverend, after all); perhaps he tried to take solace in his library after the deaths of his daughter and wife. There are five books, and you'd expect them to be of a religious or at least improving nature, and one of them to be a bible. As fas as I can see none of them has a title (the two with their spines towards us have some decorative tooling, but no words), but they certainly don't look like bibles. Bibles are almost always big, fat books, and all these are rather slim volumes. It seems a little strange that the Reverend Atkinson doesn't have a bible on his shelf. It's also rather odd that three of the books have their spines facing away from us; books are always stored spines out, for obvious reasons. Conspiracy theorists might say that the sculptor is hinting that there's something illicit about the 'hidden' books, but this is mere fantasy. As for the true explanation, I can only guess that the sculptor thought that arranging them like this would add variety to the composition. The sculptor is Henry Cox of Northampton, who was born in 1725 and died in 1810, so he was much longer lived than poor Robert. 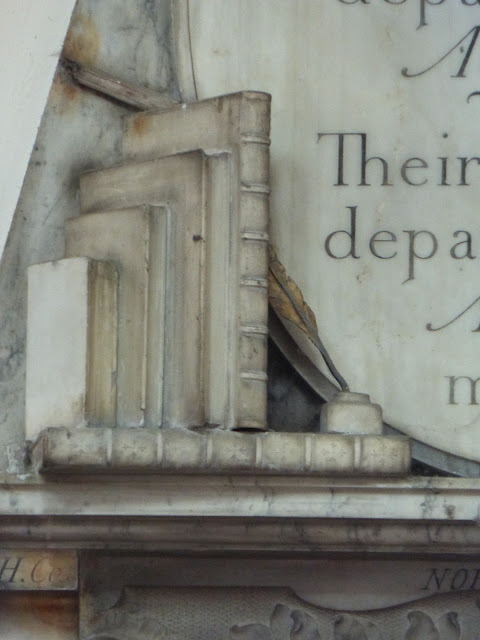 According to Rupert Gunnis's Dictionary of British Sculptors 1660-1851 there's another monument by Cox, to John Shipton who died in 1748, in Wollaston church in Northants which features books, inkpot and quill. Thanks to Henry Cox's skill, Robert, Sarah and their anonymous daughter, although 'departed', have achieved a kind of immortality. * They're difficult to see, but they're above the inscription, sitting on top of the crown. Professor Wikipedia says that hearts have been used as a symbol of romantic love since the late Middle Ages.